A Palestinian scholar of the third and fourth centuries, contemporary of R. Abbahu. While the country of his birth can not be named with certainty, he was probably born in Babylonia; for he is found there (Ḥul. 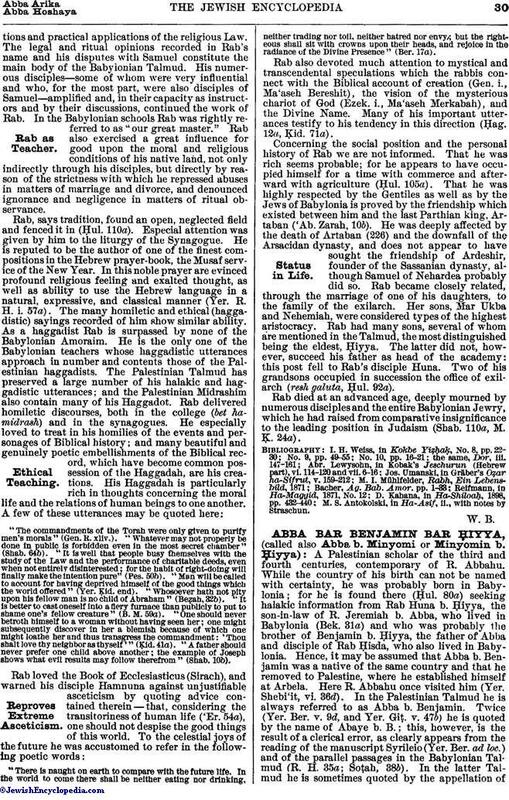 80a) seeking halakic information from Rab Huna b. Ḥiyya, the son-in-law of R. Jeremiah b. Abba, who lived in Babylonia (Bek. 31a) and who was probably the brother of Benjamin b. Ḥiyya, the father of Abba and disciple of Rab Ḥisda, who also lived in Babylonia. 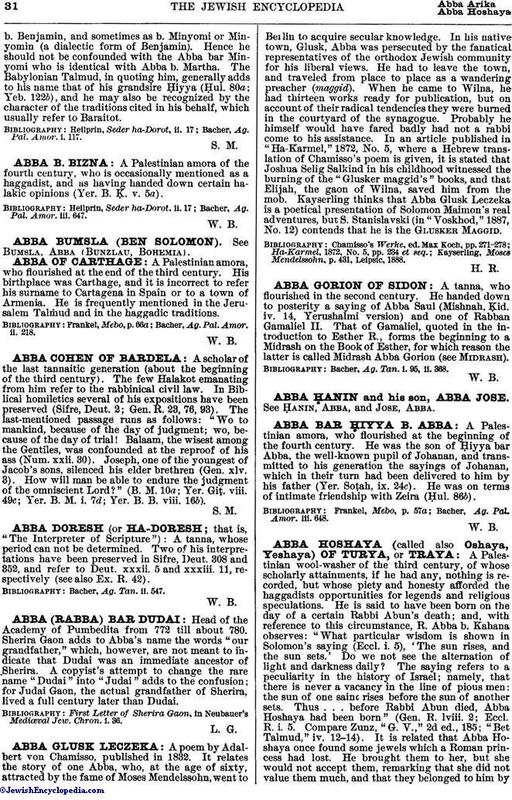 Hence, it may be assumed that Abba b. Benjamin was a native of the same country and that he removed to Palestine, where he established himself at Arbela. Here R. Abbahu once visited him (Yer. Shebi'it, vi. 36d). In the Palestinian Talmud he is always referred to as Abba b. Benjamin. Twice (Yer. Ber. v. 9d, and Yer. Giṭ. v. 47b) he is quoted by the name of Abaye b. B.; this, however, is the result of a clerical error, as clearly appears from the reading of the manuscript Syrileio (Yer. Ber. ad loc.) and of the parallel passages in the Babylonian Talmud (R. H. 35a; Soṭah, 38b). In the latter Talmud he is sometimes quoted by the appellation ofb. Benjamin, and sometimes as b. Minyomi or Minyomin (a dialectic form of Benjamin). Hence he should not be confounded with the Abba bar Minyomi who is identical with Abba b. Martha. The Babylonian Talmud, in quoting him, generally adds to his name that of his grandsire Ḥiyya (Ḥul. 80a; Yeb. 122b), and he may also be recognized by the character of the traditions cited in his behalf, which usually refer to Baraitot. Bacher, Ag. Pal. Amor. i. 117.